I was sure it was going to be a cake filled with lemon curd and topped with a toasted meringue frosting. Then, I changed my mind and considered a simple, vanilla angel food cake with strawberries on the side. And, there are two different pistachio cakes that I’ve wanted to try for ages. I have a hard time choosing when it comes to my birthday cake. In the end, my decision was made when I remembered the Burnt Caramel Cake in Basic to Brilliant, Y'all . I mean, caramel covering multiple layers of cake? Of course I had to make this. There are three cake layers rich with butter and eggs, and the icing is a cooked caramel made thick with butter and cream. In this book, every recipe has a tip for making it “brilliant.” For this cake, an embellishment of apple hazelnut compote is suggested as a filling between the layers which sounds lovely but in more of an autumnal way. I decided to dress it up with chopped, toasted pecans between layers instead, and I sprinkled big flakes of sea salt on top. The recipe is available online, but there’s a missing bit of instructions. It skips over adding the eggs which should be mixed in after the butter and sugar have been creamed. The instructions for the caramel icing are great though. This reminded me of the frosting I made for Kurt’s birthday cake which needed to be spread swiftly which I learned as I went. Here, Virginia Willis points out that if you place the bowl of caramel icing in a bigger bowl of warm water, it keeps the icing from setting quite so quickly. It’s a great tip and one I’ll remember next time I work with a similar frosting. Once on the cake, the caramel sets nicely and, the cake stores well at room temperature. 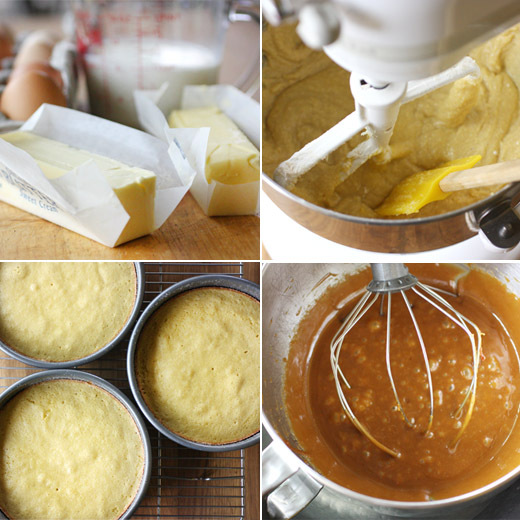 It’s a simple cake to make which starts with softened butter that’s creamed with sugar. Next, four eggs were added one at a time and mixed into the butter. Flour that had been sifted with baking powder was added in three parts with milk being added alternately. The batter was divided among three pans, and the cakes baked for about 25 minutes. To make the icing, sugar was caramelized in a skillet while more sugar, butter, and cream were brought to a boil in a saucepan. The caramelized, or burnt, sugar was then poured into the cream mixture, stirred to combine, and cooked to reach the soft-ball stage. Off the heat, vanilla and salt were added. It was allowed to cool a bit before being whisked in a stand mixer. Placing the bowl of icing into a big bowl of warm water worked perfectly to prevent it from setting too quickly as the cake was assembled. Still, once the icing was spooned onto the cake, it needed to be spread quickly before setting. I had toasted and chopped some pecans in advance and sprinkled them on the two bottom layers after spreading the caramel icing. 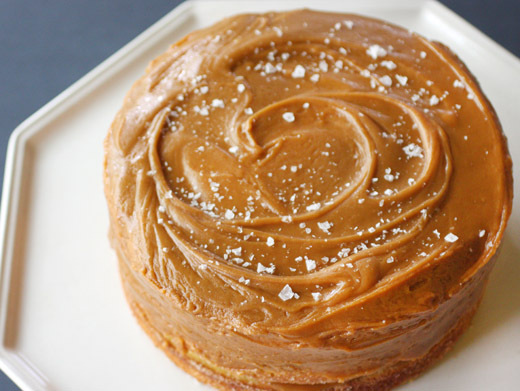 This is an old-fashioned, caramel-dream of a cake. It was like one giant, Southern praline wrapped around layers of buttery, vanilla cake. I'm not good at deciding on a flavor of ice cream when presented with several options either. This wasn’t a quick decision, but I think I finally chose well. This cake looks and sounds amazing! I wish I could taste it right now. simple cakes are my favorite cakes. Plus caramel is like a candy for me, always welcome. Caramel is always the first choice! The cake looks irresistible. I could lick the bowl of the icing. Happy Birthday! HAPPY BIRTHDAY, LISA!!!! Wonderful cake, I knew you were going to come up with a masterpiece, and you really really did it! I am in Lisa at the mere mention of caramel. Happy Birthday Lisa! The Burnt Caramel Cake is fitting for a birthday celebration, outstanding! Love how layered this cake and covered with caramel! Looks super yummy! Bet pecans are great suprise inside! Pinning it to try later! Simple and delicious looking cake.. Love the deep gold color!!! The pictures are stunning and so are the colors! Oh. My. Goodness! This cake looks phenomenal! Absolutely delicious and decadent. Happy birthday! Decisions, decisions! In the end, I think you chose very well. Who can ever resist anything with burnt caramel, after all? I am officially starving after looking at this!! These photos are amazing! I'd like to invite you again to the CookEatShare Author Network. I don’t want the over 1 million unique monthly visitors to CookEatShare.com to miss out on your wonderful food. Oh, yeah...I'd pick this for my birthday cake, too! I'm all in favor of anything caramel...especially if it involves triple layers! YUMMY! That looks amazing, Lisa! I'm a sucker for caramel and love the way it stays firm all over the cake - much easier to frost, I guess. what a fantastic frosting! 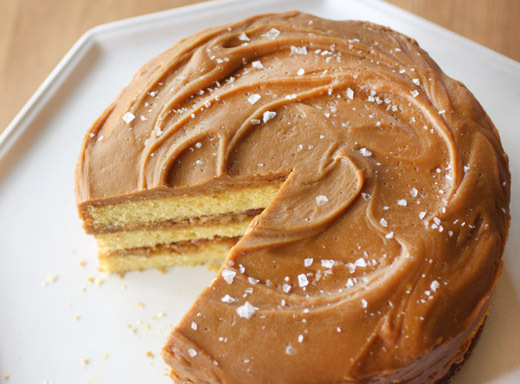 a good caramel frosting is absolutely impossible to beat, but i haven't found a cake that does it justice. as birthday cakes go, i'd definitely say you chose well! Oh wow yum, your cake looks and sounds amazing! What a fantastic choice for a birthday cake. Think I would need a lot of self control not to have more than one slice - I like both of the options for the filling. Happy birthday. I would be hard put to decide between a caramel cake and one with lemon curd and meringue. Tough choice. Love your blog and recipes! Happy Birthday! I always have a hard time choosing what to make too. This looks like a great choice! Caramel is always tasty and when it's used to frost cake, you can't lose! Happy Happy Birthday!! A delicious cake for celebration! !